← Caramel Popcorn With What? Posted on November 16, 2012, in Holiday Cards, Miscellaneous. Bookmark the permalink. 12 Comments. I’m so glad toilets that work came before a small tv for the room…then again, he did ask for chipotle before toilets. Hmmm? I love how it ranges from a new car to silk boxers…lol kids are funny! When I were 16, I think clothes would have been on my list for sure. Plus money for vacation with my friends! 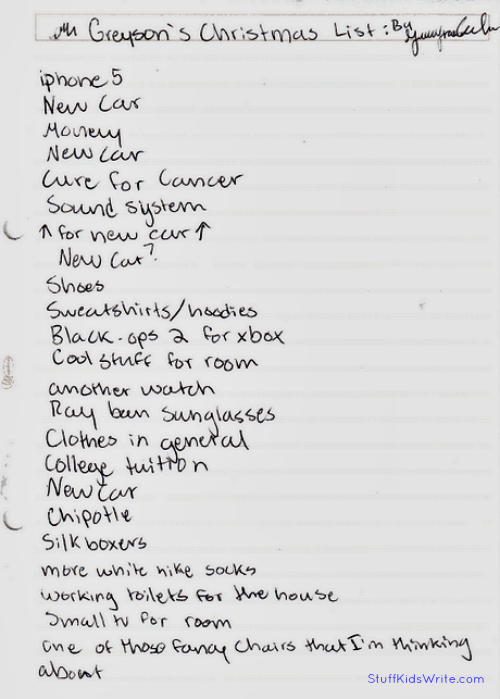 Now that I am not 16, my “Dear Santa” list is all about enough money to pay the bills and a good job! Things change! P.S. Our toilets totally work!!! I’ll ask for a few things that my family would be happy. I’am going to shock them and say that I would rather see them get something special. If I must give other ideas, let me ask for a Wii. It is interactive fun for the whole family. I totally want one of those fancy chairs he is thinking about. They sound pretty great.